It’s one thing for a regular player to report somebody who might be cheating or griefing in a game like Fortnite, but when a Twitch star does it? Then it unavoidably carries a different weight, especially when it’s the Twitch star, Tyler “Ninja” Blevins. Over the past week, Blevins has found himself surrounded by an ever-encroaching storm of criticism for reporting other players—even though the players he reported seemingly didn’t face consequences. Blevins has reported people on stream before, but the incident that kicked off this particular controversy saw him angrily report a player who he believed had stream-sniped him earlier this month. “I’m going out of my way to get this guy banned,” he said after getting killed in Fortnite. He believed that the player had been watching his stream in order to find and kill him. When that player emoted after the kill, he took that as proof of stream-sniping (the idea being that he was emoting in response to hearing Blevins’ teammate and fellow streamer DrLupo say “watch for the emote”). Calling him an “idiot,” Blevins reported the player. 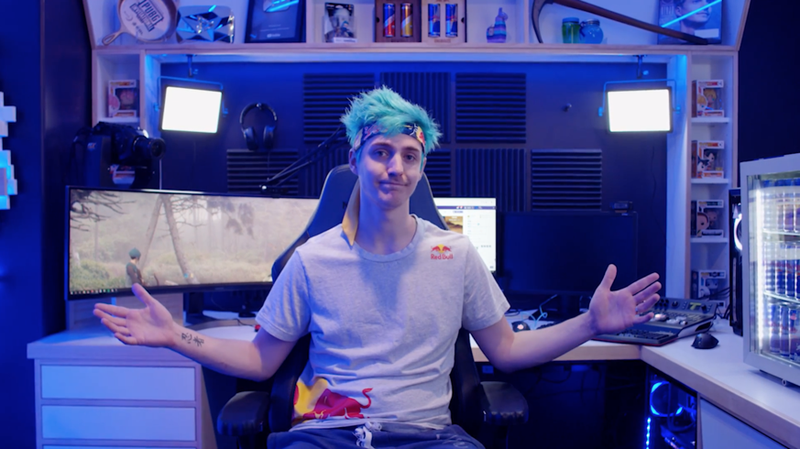 This response didn’t do much to help Ninja’s reputation with his fellow Fortnite fans. Flash forward a week, to last Saturday: a different player claimed that Ninja had reported him in October for “having higher ping” than him and that, a few days later, he got banned by Epic. The ensuing Reddit thread got over 44,000 upvotes, leading to more speculation that Blevins had more power than the average player to get his rivals banned. On Oct 2nd, Account B was disabled for reasons unrelated to player reporting. On Oct 3rd, Account A was reported by Ninja. It was investigated and not actioned due to lack of evidence. On Oct 4th, Account A changed their display name away from the name reported on October 3. On Nov 13th, Account B was re-enabled based on a review of the underlying system. On Nov 17th, account B changed their display name to match the display name of account A at the time of Ninja’s report. In other words, nobody got banned due to Blevins’ actions, but somebody either juggled multiple accounts or quietly changed one account’s name to that of another to make it look like their unrelated ban resulted from Blevins’ report. Yesterday, in an interview with YouTube drama maven Daniel “Keemstar” Keem, Blevins said he thinks that Epic’s correction isn’t going nearly as far as the false information that preceded it. He pointed to it as evidence that Twitch fans abandon their old favorites when they achieve success. “LeBron signs a big deal, no one’s like ‘I’m not gonna support LeBron anymore. He makes enough money. I’m not buying his jersey,’” he said, also asserting that flaunting wealth is the “goal” of rap music. Granted, it’s worth noting that Blevins did recently post something like that in the form of his top-of-the-line, extremely blue new stream room. And while there were definitely some responses like “stop flexing, we get you are rich,” others expressed excitement and awe. Since Fortnite came out, a major part of Blevins’ appeal has been his meteoric rise to fame and fortune—the broken records, the mainstream recognition, the collaborations with rappers and demographically adjacent figures like, er, Ellen DeGeneres. Longtime fans feel like they’re with Blevins on that journey, while newcomers just want to see where it all ends up. “I’ve been with you since your first video,” reads a comment on a behind-the-scenes video of the new stream room, echoing a commonly repeated sentiment among Blevins’ fans. The real issue here is twofold: One, Twitch streaming is still tied to increasingly unrealistic expectations of authenticity, of real people chilling, playing video games in their bedrooms, and feeling like they’re viewers’ best pals. The further somebody like Blevins strays from that—even if, arguably, he hasn’t been that in a while and never was in many respects, because streaming is ultimately an act, just like any other performance—the more blowback they’re likely to face. But of course, Blevins is only human, and he’s a human who happens to be under more pressure than many. He’s fabulously wealthy, but he’s also constantly performing for immense live audiences and constantly escalating those performances. It’s not surprising to see him lose his cool. When people are under stress, tempers flare. It’s also about as “authentic” as it gets, but Twitch fans have been conditioned to rarely want to see streamers’ ugly sides—only the quips and the quirks. Blevins has said quite a few dumb things and made some big mistakes—and he is ultimately responsible for those things—but there’s more to it than a simple, sudden heel turn. He is, in part, a product of his career and a platform that can drive the people who butter its bread to the brink. During the Keemstar interview, Blevins said he plans to stop “giving more ammunition to fuel the fire” and is more focused on moving forward than looking back.